Red cabbage is a very healthy vegetable which should be part of your diet regularly. Continue reading about all the health benefits of red cabbage. Red cabbage is a cruciferous vegetable, also known as the purple cabbage. This vegetable is very delicious regardless if you eat it raw or cooked. Raw red cabbage is often commonly included in salads but is also often sauteed, braised, or steamed with other vegetables. Due to its high fiber content, red cabbage can prevent constipation. It also lowers the risk for diverticular disease or other diseases of the gastrointestinal system such as irritable bowel syndrome, etc. But, these are not the only benefits of red cabbage. Continue reading and learn about other red cabbage benefits. Red cabbage is a very healthy vegetable which plays an important role in preventing cancer due to its antioxidant properties. Antioxidants help neutralize the free radicals which are harmful products of the cellular metabolism accumulating in the body. Free radicals are responsible for a number of diseases, including various types of cancer. Indole which red cabbage contains is known to reduce the risk of breast cancer in women. Vitamin A which red cabbage contains is also known to reduce the risk of lung cancer. If you are trying to lose some weight than eating red cabbage, both, raw or cooked can be very beneficial. As it is very low in calories and packed with many healthy nutrients and vitamins, red cabbage is a real powerful vegetable. One of the many red cabbage benefits is the anti-aging property as well. Due to the fact of being rich in antioxidants and vitamin A, red cabbage can help you look younger for longer. Antioxidants will keep your skin more elastic and tighter. They will reduce the wrinkles and age spots as well. On the other hand, vitamin A helps skin cells regrowth, protects it from sun damage and helps the skin maintain its elasticity. Red cabbage due to high levels of vitamin A is not only beneficial for the skin, but for the eyes too. Vitamin A helps prevent the formation of cataract, and macular degeneration. It also helps the eyes remain healthy as we age. 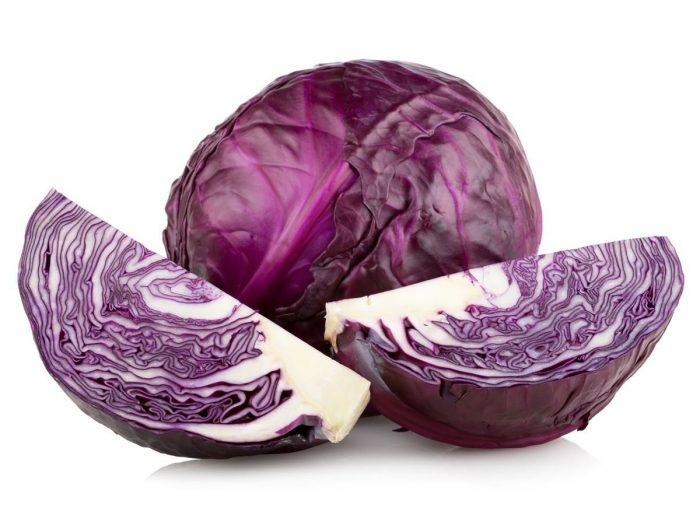 Thanks to glutamine, a specific amino acid, red cabbage can help you treat gastrointestinal ulcers. This specific amino acid works by reducing the inflammation and relieving the pain associated with these ulcers. For the treatment of ulcers, the juice of red cabbage is especially recommended as a natural at home treatment for ages. Red cabbage is packed with nutrients and vitamins, especially vitamin C. Vitamin C is an important antioxidant which boosts the immune system, stimulating the activity of white blood cells. It also boosts the production of collagen which keeps the cells solid and connected. This is another one of red cabbage benefits. Red cabbage has also been found to be beneficial in preventing Alzheimer’s disease. The anthocyanins which red cabbage contains tend to reduce the occurrence of plaques which lead to the development of Alzheimer’s disease as we age. If you want to have healthy bones you should consume red cabbage. This vegetable is packed with certain essential minerals which tend to increase the bone mineral density, protecting you from osteoporosis, arthritis, etc. Cabbage is also beneficial for your cardiovascular health. According to the University of Maryland Medical Center, vitamin C lowers the risk of heart diseases such as hypertension, atherosclerosis, etc. Red cabbage is rich in vitamin C and for this reason, it should be part of your regular diet. Red cabbage is also a good source of vitamin B6, which is known to regulate the levels of homocysteine. Homocysteine is an essential amino acid, which when accumulated in high concentrations increases the risk for various heart diseases. As mentioned, red cabbage is packed with vitamin B6. This vitamin supports the normal function of the nervous system. Only, one cup of red cabbage fulfills 11 % the daily requirements of the human body of vitamin B6. If there is vitamin B6 deficiency, the affected person will be more vulnerable to seizures and epilepsy. Everything should be consumed in moderation, including red cabbage regardless many great health benefits. Excessive consumption of red cabbage leads to flatulence, diarrhea, hypothyroidism, etc. Red cabbage should not be consumed by those who take blood thinning medications as it contains high levels of vitamin K, which can cause blood clotting. Red cabbage should not be consumed by pregnant or breastfeeding women as babies can develop colic. There are many ways how you can include red cabbage in your diet. You can eat it raw included in a salad, or you can steam and brew it together with other vegetables. When cooked, red cabbage will turn blue, so if you want your red cabbage to still remain red after cooking you should add some apple cider vinegar to the pot. A significant reduction of red cabbage benefits occurs when red cabbage is cooked, compared to fresh red cabbage. If you want to get the best of red cabbage, then you should consume it raw. However, if you still prefer cooking it then, try adding less water, cooking it only shortly so you can get all the benefits of this very powerful vegetable. The more red cabbage is cooked, the more nutritional benefits it will lose.